It has been a little while since we’ve updated the community on the progress being made with the Flint Park Revitalization. It has been a busy winter with lots of work going on behind the scenes. 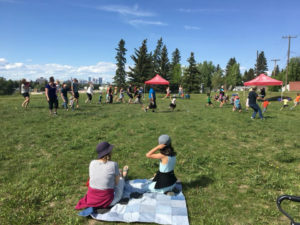 We have been applying for grants to secure funding, meeting with a Landscape Architect and Pump Track Builder and working with our partners at The City of Calgary to determine how to make the most out of this piece of park space. Our goal upon completion is to have a bicycle Pump Track constructed from Asphalt, along with giant climbing boulders and improved landscaping and seating areas. All of this will be located at the far Southwest end of Flint Park. Whether all those features can be built in 2019 will depend on the funding that we can secure in the form of grants, however our aim is to have at the very least a Pump Track built by the end of this summer. Keep an eye on the Fairview website and Facebook page for our Conceptual drawing renderings that have been produced by our Landscape Architect for an overview of what the completed project will look like. For any questions please feel free to contact us.